In the first part of this article, I explained some of the problems typically associated with data management in a HR department, and put together a functional specification for a Web-based application to make the task easier. After putting together a basic database schema and normalizing it, I proceeded to develop scripts to display job listings, accept user applications, and store these applications in the database. While the first part of this article described the user experience, I have not yet addressed the issues of updating the job board with new information, removing existing entries, or searching for potential candidates - all of which formed part of the initial feature set of this application. And so, in this concluding article, I'm going to wrap things up by looking at some of the tasks an administrator would need to accomplish in such a system, and developing some simple scripts to accomplish these. If you remember, when I first put together the "listings" table, I added a couple of dummy entries to it, just to get things rolling. Now, that's fine during the early stages of application development...but you can't expect your customers to pop open a mySQL prompt every time they need to update a job listing. For one thing, they may not have the technical acumen necessary to manipulate a mySQL database; for another, they may prefer a pretty GUI to an ugly command-line. Either way, as the developer, you're on the hook to package those functions into your application as well. Consequently, I'll begin by putting together an entry point for administrators, in much the same way as I did for users. This page will serve as a menu to the different administration functions available. As you can see, it's almost identical to the user entry point, with the exception of the edit and delete links next to each job. Each of these calls a script to perform the appropriate function. The bottom of the page also includes links to add a new listing, or search the database for potential candidates. It should be noted at this point that access to all these administration scripts should be restricted to privileged users only. The easiest way to do this is to move them into a separate directory, and protect it using Web-based authentication. 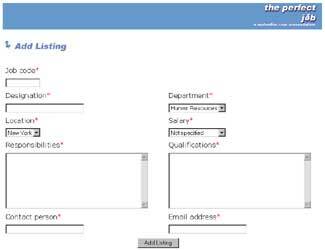 The script "add.php" display a form which allows an administrator to add a new job listing to the system. The script is divided into two sections - one section displays a form, while the other section processes the data entered into it. The $submit variable is used to decide which section of the script to execute. Nothing too complicated here - this is simply a form, with text fields for some elements of the job listing, and drop-down boxes for the remainder. You will notice that the items in the drop-downs are generated from the database; you probably remember this from last time. Notice also the ACTION attribute of the <FORM> tag, which is pointing to a PHP variable called $PHP_SELF. This is a built-in PHP variable which always holds the name of the currently-executing script; by including it here, I am ensuring that the same script is also called to process the form. Once the form is submitted, the same script is called again; however, since the $submit variable will now exist, the second half of the script springs into action. The error-checking mechanism used here should be familiar to you from the job application form in the previous article...although the validation routines here are a little simpler, since this form is far less complex. Once the data has been validated and found to be acceptable, an INSERT query takes care of saving the data to the "listing" table, so that it immediately appears on the job listing page. The "edit.php" script is almost identical; it accepts a job listing, connects to the database, retrieves the record, and displays a form with the values filled in. The administrator can now update the listing and save it back to the database. Once the form has been submitted, an UPDATE query is executed to update the database with the new information. The "delete.php" script is the simplest of the lot. 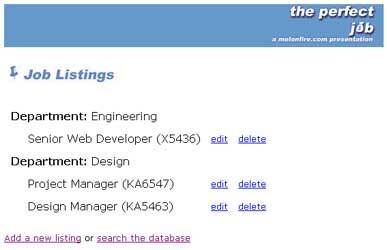 It accepts a job code, connects to the database, DELETEs the appropriate records, and redirects the browser back to the menu. Just as I have these scripts to alter the "listing" table, you can develop additional scripts to modify the other ancillary tables - "country", "salary" et al - if you like. That said, it should be noted that not all the tables will change on a regular basis (for example, how often are you likely to update the list of countries?) Some tables will be set up with an initial set of records, and will remain unchanged for long periods of time, while others may change on a weekly basis; as the developer, it's up to you to anticipate the likely requirements of the customer, and develop administration modules appropriately. Next up, the search function. This is probably the most-used function in this type of system, since it allows administrators to quickly extract a set of applications which match pre-defined criteria. As before, the script has two sections, one for the form and the other for the processor. Here's what the form looks like. I've implemented two different levels of search here. The first level simply displays all applications for a specific post, as selected from a drop-down list. This comes in very handy when you need to count the number of applications received in response to a particular listing, or aren't too sure what you're looking for and just need to eyeball a bunch of resumes. This list can be further refined by specifying the type of educational qualifications and/or the skills and experience the candidate should have. While the educational qualifications (degrees and subjects) can be selected from a list, the skills may be entered into a free-form text field, separated by whitespace. The administrator also has the option of specifying the level of expertise required, with a set of comparison operators. Once the form has been submitted, a basic query is generated to return a list of applications for the specific job. Then, depending on the criteria selected, that basic query is further modified with AND clauses to refine the list of results. The end result of this will be a list of names and email addresses, linked to a script which displays detailed information for that candidate. Of course, this is only one option for the search engine. There are numerous possible configurations, and you may need to modify this as per your specific requirements. 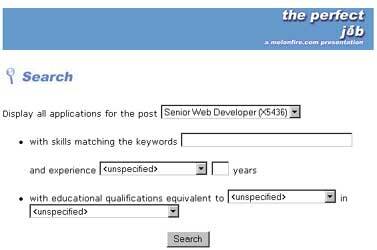 One of the obvious flaws in this one, for instance, is that it assumes the same level of expertise for every skill selected - there's no way I can look for candidates with three years experience in Perl and five years experience in C++. In order to accomplish this, I would need to create multiple skill-experience field pairs, and query against each of them. It should be noted also that there is an alternative approach to this keyword-search technique. Currently, my application form allows applicants to enter skills in whatever format they desire (each skill is a text field, not a list.) If, instead, I had an exhaustive list of skills available, I could have the candidates simply select from a list box, adding an extra level of integrity to the data being collected. This would also make the search process more efficient, by doing away with the wildcards and LIKE clauses in the queries above. The downside of this approach is that, since you are restricting the candidate to a pre-defined list of job skills, the list must be exhaustive enough to cover all possibilities. Since this seemed difficult, I decided not to adopt this approach, and instead went with the free-form approach...but if it works for you, you might want to consider it. The "resume_details.php" script represents the end point of the administrator experience. Its purpose is to compile all the information stored about a specific candidate in the various tables into a composite data sheet, and display this in a structured format. Nothing too complex here - there are five main sections, and this script queries the corresponding five tables to build a data sheet containing the candidate's personal information, employment history, educational qualifications, references and skills - in effect, doing the reverse of the "apply_rslt.php" script. This data sheet has all the information an HR manager needs to get in touch with a candidate and begin the recruitment process. The last script - and the simplest - is the error handler, "error.php". If you look at the source code, you'll notice many links to this script; very simply, "error.php" intercepts the error and converts it to a human-readable error message, which is then displayed to the user. There was an error accessing the page you requested. Please <a href="job_list.php">return to the main page</a> and try again. And that just about concludes this case study. Throughout this development effort, I have made widespread use of database normalization techniques, PHP's built-in functions, HTTP headers, and mySQL database queries. If you are new to PHP, I hope that the effort has been instructive, and that it has helped you gain a greater understanding of these powerful open-source tools. I believe that a tool such as the one described over the preceding pages offers tremendous benefits to any organization in its recruitment efforts. By obtaining and storing information in electronic format, it reduces paperwork; by imposing a structure on user information, it makes it easier and quicker to locate information; and by using a database, it ensures that data does not get corrupted. Until then, though, I'm going to kick back with a cool drink and a good book.